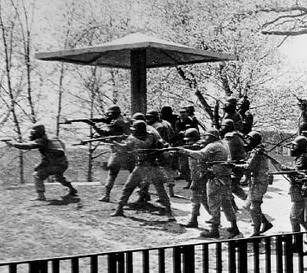 May 9, 2012 ~ The killing of four students on the campus of Kent State, Ohio, on May 4, 1970, during a demonstration against Nixon’s expansion of the Vietnam War into Cambodia received new attention on April 23, 2012. The Obama administration’s Justice Department decided not to re-open the case in spite of evidence that the guardsmen had been ordered to shoot. This reminded the public that the question of who ordered the shooting has never been resolved. The first of an occasional series on the place that has become TUC Radio’s new home: Mendocino County, Northern California, to honor extraordinary people and events in this remote region. Here is the connection between a small local newspaper in Anderson Valley http://www.theava.com, a rural radio station, KZYX http://www.kzyx.org, a woman, Laurel Krause living on the Pacific ocean near a former logging mill town http://www.truthtribunal.org and a veteran radio programmer, Jeff Blankfort http://radio4all.net with events that shook the world in 1970. Also referenced in this re-broadcast is Michael Moore, film maker Emily Kunstler and Congressman Dennis Kucinich. All together a piece of living history assembled in the mountains of Northern California. Recorded May 9, 2012.